It’s the season of extravagant dining, gift giving and blushing beneath the mistletoe. So gather your nearest and dearest and start a new festive tradition with Belmond. After all, it’s the most wonderful time of the year. Step in from the crisp winter air at London’s Victoria Station. Board the warm, timeless carriages of the Belmond British Pullman. The gleaming brass and ornate marquetry is offset with colourful tinsel and festive decorations as you’re led to your table. This year there are a wealth of journey options to fuel your festive fire. Travel in style to the Christmas markets in Winchester, Bath or Lincoln. Listen to a magical carol service in the crypt of Canterbury Cathedral. 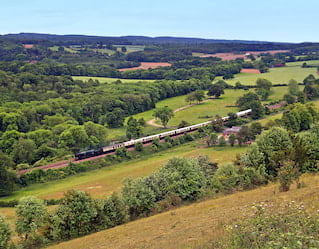 Or simply sit back and enjoy a traditional Christmas lunch as you wind through the English countryside. As the holidays approach, the grand lobby at Belmond Charleston Place undergoes a magical transformation. Each year the Nappi family install a very special holiday train, inspired by the legendary Venice Simplon-Orient-Express. The fully-operational train covers more than 300 feet of track, passing an 8-foot mountain and delicately hand-made trees, ski-resorts and vintage automobiles. It’s been a staple of Charleston’s seasonal celebrations for over 20 years. 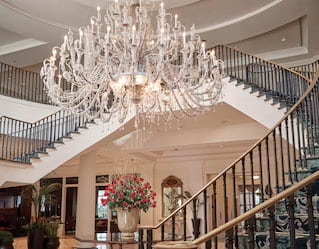 Journey to Belmond Charleston Place to see the set up for yourself. Then enjoy a timeless feast in Charleston Grill before retiring to your luxury suite. Picture the scene. A stunning manor house in frost-tinged fields and forests. The glow of a roaring fire and twinkle of fairy lights beckon you inside. Raise a champagne toast before crossing the countryside. Guided by torchlight you’ll head to the ancient conclave of St. Mary’s Church, dating back to 1066. Inside be treated to a stunning carol concert performed by some of the world’s finest vocal groups and choirs. 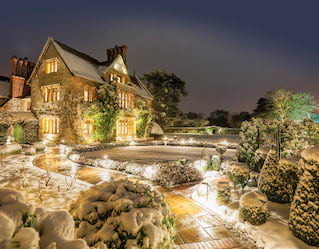 Full of festive cheer, head back to Belmond Le Manoir aux Quat’Saisons and take your seat for a stunning five-course two-Michelin star dinner. Each dish brimming with seasonal specialities and innovative twists on classic recipes. Let the wine flow; it’s beginning to look a lot like Christmas. 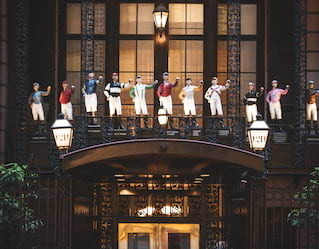 In a city where dreams are made, few places are quite as magical as New York’s ‘21’. Find whimsical toys adorning the Bar Room ceiling, and spellbinding murals Upstairs at 21. It’s no surprise the restaurant has been a haunt for the city’s stars since Prohibition. For 80 years, families and friends have gathered here to celebrate the season with the Salvation Army Band. Take a seat with us this December and be spirited away by sensational cuisine combined with classic Christmas carols and holiday tunes. Dreamily lit snow-frosted streets, skating across frozen lakes, troika rides through the countryside… St Petersburg is a postcard for winter sparkle. 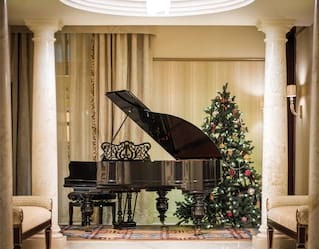 Few places capture the romance of the season quite like Belmond Grand Hotel Europe. Aside from the sensational festive parties, the hotel’s signature festive gift hampers are not to be missed. They brim with gastronomic treats handpicked by Executive Chef Ian Minnis. Orangette dipped in dark chocolate, signature almond and caramel Christmas cookies, and decadent chocolate from the in-house factory. It’s the perfect way to spoil someone special.